Elon Musk promised a "Sentry Mode" yesterday. When Andy Sutton found a huge dent just below the door handle of this Model 3, he took to Twitter: “Really wish there was 360 dash cam feature while parked,” he wrote on Tuesday. Lo and behold, Tesla CEO Elon Musk swooped in to answer his call: three hours after Sutton’s initial tweet, Musk replied that a “Sentry Mode” will be “coming soon.” Presumably, the new mode would act as a high-tech, high-resolution dash cam that ensures your Tesla is secure from bad guys while parked. The feature will be limited to Tesla customers who shelled out $5,000 upfront for the company’s futuristic Enhanced Autopilot mode. The car will also have to be outfitted with Tesla’s latest Autopilot 2.5 hardware package from 2017 or newer for the feature to work, Musk clarified in a follow-up tweet. Enhanced Autopilot mode already enables additional features like auto-steering and automatic lane changing — even a summoning feature that tells your Tesla to drive to where you are without you having to get inside. 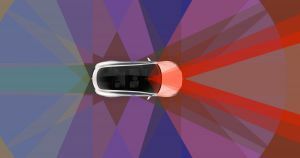 Of course, details are sparse at the time of writing — and Musk can be a jokester on social media — but the feature will presumably take advantage of the 360 degree camera feature that was introduced back in October as part of a software update. Hands off my Model 3!